There are number of popular artists from music world on MySpace. Each artist has his / her audio songs on respective MySpace profile. 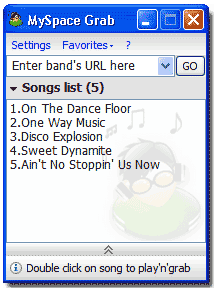 Ever wanted to download those mp3 songs or audio streams located on specific MySpace profiles? MySpace grab utility makes this possible in few simple clicks.